it was a great night for a basketball game (or a nice night in front of a roaring fire with the the spouse). I chose the game. So did about 1200 others. But after two heartbreaking losses, the big question was how would the team play against a 13-9 Louisiana-Lafayette team? Would the Mavs win by 30, or maybe come out a little flat after last weekend? After a fun first five minutes or so, it looked like we’d have a very competitive game. As typical of this year, lots of free throws. But at the 14:00 minute mark UL-L went up 12-13 and next thing you know, UL-L is up 40-15 with 5:52 left in the game. For about an 8 minute stretch or so, it seemed like we were getting some good looks at the basket but simply couldn’t make a shot, they didn’t miss many at all and we were getting dominated on the offensive glass. One shot and done. One shot, done. Turnover. One shot, done. Honestly, that was one of the more impressive runs I’ve seen by us or a visiting team in the last few seasons. UL-L, like a lot of Sun Belt teams is tall, strong and extremely athletic at every position. They really attack the basket, get to the free throw line, take and make open threes (about 40% for the game) and rebound extremely well. Amazing what depth most of the teams in our new conference seem to have. After getting the lead down to 15 at half, UTA closed it to 9 with 15:01 left in the second half at 59-50 but then UL-L went on another run to get the lead back to 20 at 70-50 with about 10:00 left. With UL-L holding on to a big lead and me sorta wanting to get on home to hot chocolate and a nice warm fireplace, I left with about 7 or 8 minutes left but as soon as I left…UTA made a big comeback to lose by only 3. Lonnie McLanahan had a great game, with 31 points. Dowell was well guarded all night, allowed no room to shoot, and had 9 points of 3-9 shooting and 0-5 from outside. UL-L’s Shawn Long, a 6’9 243 redshirt freshman transfer from Mississippi State had 31 points on 11-17 FG, 3-4 3 pt, 6-8 free throws, 8 rebounds, 1 block, 1 steal, 1 assist, 0 turnovers in 37 minutes. Unstoppable. One of the most impressive individual performances I’ve seen in a long time–reminded of the game when Marquez Haynes scored 38 or 40 I think a few years back, or the player from SFA that made 8 3s against us a few years ago. Fun to watch. This has been a crazy season so far. Soooooooo close to some huge wins. I’ve got to think one of these games will go our way at some point and that might start a long winning streak. But like I said earlier, you can see what we’re going up against every night: tall, athletic, strong teams that shoot the ball well and rebound extremely well. A league where less-than-perfect routine passes become turnovers for easy 3s or dunks. Where a couple of extra possessions or a couple of free throws or being 1/3″ too long on a jump shot or two or a few turnovers can be the difference between sweeping a weekend series and suffering a pair of defeats. It’s a competitve, talented league where it takes a great effort to earn a win each night. 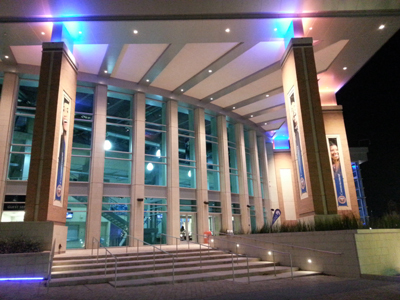 UTA (9-13, 4-6) plays Louisina-Monroe on the road Thursday. This entry was posted in Basketball, College Park Center, Game Reports, Sun Belt, UT Arlington, UTA and tagged Shawn Long by rustyhancock. Bookmark the permalink.